VNC Connect is secure out-of-the-box. 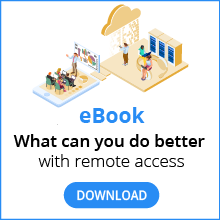 All connections are encrypted end-to-end, and by default remote computers are protected by a password (Home subscriptions) or by system login credentials (Professional and Enterprise subscriptions). For an overview and links to whitepapers, penetration tests and more, see our dedicated security and compliance page. Buy (or contact us to switch to) an Enterprise subscription. On the Security page of your RealVNC account, enable 2-step verification for yourself. On the People page, only invite people you trust into the team. On the General page, mandate 2-step verification for everyone. On the Computers page, restrict discovery permissions appropriately. Install VNC Server in a secure location (such as C:\Program Files), and turn on update notifications. Upgrade to 256-bit AES by setting the VNC Server Encryption parameter to AlwaysMaximum. Turn off direct connectivity by setting the VNC Server AllowIpListenRfb parameter to FALSE. Only establishing cloud connections will mean no holes in firewalls. Reduce the number of unsuccessful authentication attempts allowed by lowering the VNC Server BlacklistThreshold parameter. Disconnect idle sessions earlier by lowering the VNC Server IdleTimeout parameter. If the owner will be physically present when people connect, turn on connection approval. If the remote computer is running Windows, turn on screen blanking. Lock or log out the remote desktop when the last user disconnects by setting the VNC Server DisconnectAction parameter. Review connection audit logs on a regular basis. We do not record remote access sessions, and never store remote computer passwords. We don’t store payment or credit card information either; that’s stored on our behalf by a PCI DSS-compliant vendor. Enable analytics when installing VNC Viewer. Either enable analytics or update notifications when installing VNC Server. Sign in to VNC Viewer in order to discover cloud-enabled computers or to sync your address book across devices. Have instant support, in which case we automatically record certain session events (not the sessions themselves) for review purposes. Don’t add the instant support capability to your subscription. Only establish direct connections to remote computers.